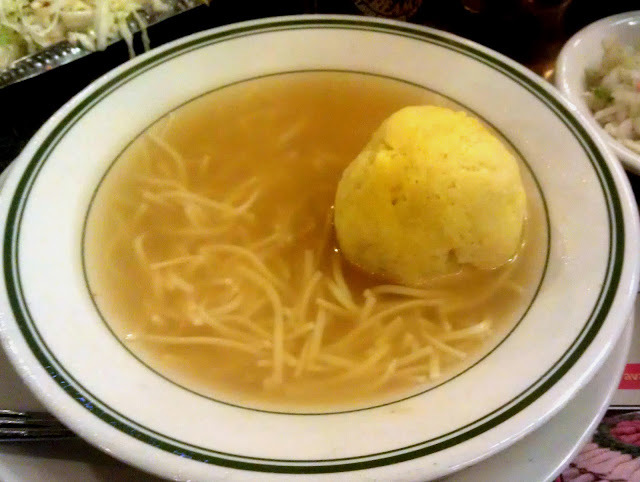 Some days I really just want a good matzoh ball soup. On days like that, when I can’t get to Grandma’s house, or Katz’s Deli, I often find myself at Ben’s on 38th Street in Midtown. The matzoh ball soup is just comforting enough to put my mind and body at ease, with a good homemade chicken broth and a fluffy matzoh ball that appropriately sticks out most of the way from the soup. I would like the matzoh ball a little more al dente, but I recognize that, like many things in Jewish cuisine and culture, the texture of the ideal matzoh ball is the subject of intense debate. Outside of Passover, I usually add noodles for extra comfort. Ben’s Kosher Delicatessen has five locations in Manhattan, Queens, and Long Island, as well as one (of course) in Boca Raton. In addition to the matzoh ball soup, it features excellent pickles and coleslaw, old favorites like kashe varnishkes, and overstuffed sandwiches with very good pastrami on rye. My go-to is the “Double Dip,” which gets me a matzoh ball soup and half a pastrami sandwich–more than enough for a big lunch–for under $15. It reminds me of Grandma’s. After all, there’s a Ben’s in her shopping mall.